Open world games are a popular choice among gamers, not only do they allow you the freedom to pretty much do as you please, you can work through them at your own pace. In a world where gamer rules are king and self-guided missions are the driving force, you may find yourself spoilt for choice. But, whether you like to explore post-apocalyptic land, create your own kingdom or race in unchartered territories – there’s pretty much something for everyone in our round up of the best open world games. Open world games allow you to have a fully immersive experience and pretty much give you the opportunity to do whatever you want. If you like creating your own land, then you’ll likely enjoy Minecraft where you can build your own cities and create your own adventure. If that’s not enough for you though and you want a bit of gameplay thrown in as well, then games such as The Witcher 3 and Grand Theft Auto 5 will give you quests and tasks to complete to add an element of competition into the mix. For us, the best open world game has to be Assassin's Creed Origins - a fascinating action-adventure game with a strong storyline, real world scenarios and fantastic graphics. If you’re looking for an interesting storyline with good graphics and immersive surroundings, then Assassin’s Creed: Origins is a game you can expect to deliver. Whether playing solo or with others, this is a game you could play for hours and not get bored as there is so much to see and explore. Not only is it a fantasy game but it has real life history to see too, so if you’re a fan of Ancient Egypt, you’ll no doubt find this game even more fascinating to play. This action role-playing game can become highly addictive and immersive with a range of different things to do in this open world. You’ll be playing as the Witcher, the highly skilled monster slayer that is hired to battle beasts and demons. You’ll be able to take part in different quests and training to build up your skills and strength, and you’ll be rewarded with new weapons and armour and credits for other experiences like horse races, card games and more. This is a game you can take at your own pace, and there’s plenty to explore to keep you occupied for hours. Subnautica offers something a little different to other open world games, with an exciting new angle that will keep you on your toes. It’s based underwater and those who have played this game say it can get a little creepy in parts, so if you’re a horror fan you can expect to enjoy this game. The game isn’t quite complete, but if you think you like the look of it then it’s definitely worth getting it on early release and enjoying what’s already there. The graphics, even in its early stages are said to be impressive and as far as bugs go, users haven’t experienced many problems at all. This open world game is a battle for survival as you find yourself stranded on the shores of an island called Ark. You’ll have to hunt your own food, find resources, make your own weapons, build shelter and figure out how to stay alive through whatever the game throws at you. This is certainly one that requires some brain power, and you can also team up with other players to help each other survive and eventually escape the island. This is a great one for playing with others, and with great graphics, detailed storylines and lots of unexpected turnings, this game will have you on the edge of your seat. Head down under and explore Australian lands in your own way with this driving game. It’s completely customisable, including your character, car, license plate, and even your own music. This is a casual and fun game that allows you to do what you want, when you want while practicing jumps and racing other cars. Players are impressed with the stunning visuals and like that it’s not purely a racing game, but a game that allows you to explore as much as you like without time constraints. If you’ve not really played many racing games before, this is a good one to get you started and practice technique. 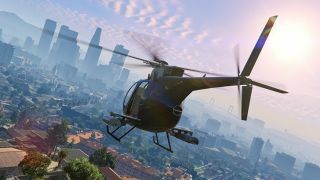 Grand Theft Auto is a world with no rules and you can certainly go a little crazy and see just how much trouble you can cause in the City of Los Santos. There are three different characters to choose from, which players have said are much crazier than in some of the previous games. You’ll come across a whole range of characters in this world, and most likely end up in some strange and dangerous situations at times, which makes it all the more fun when trying to hustle your way out of them. Venture through a post-apocalyptic wasteland in Fallout 4, with hundreds of locations from deserted forests to the ruins of the city. This game has a lot of detail which is what makes it incredibly immersive, with so much to uncover. Players were surprised at how much more there was to do compared to previous Fallout games, but some have found it a little tricky to get to grips with. There’s a fair bit of violence and swearing in this game, so it’s not one for youngsters. Minecraft is proof that it’s not always all about the graphics. This simple game took the world by storm, with an imaginative open world that is ready for you to build up and make your own. It’s a great game for all ages to enjoy and it encourages imagination and creativity. It can get highly addictive as you see your very own creation come to life before your eyes and it’s relatively intuitive to play on different platforms. If you want to have free rein and don’t like having to complete too many tasks in order to progress, this is the game for you.